strange brew. the mix of politics, snowmen and history. As long as there have been humans in the snow, there have probably been snowmen. Trying to discover where the first one was built is like trying to track down the first person to ever sneeze; almost as soon as it happened, it was gone. But, throughout history, some of our frosty friends have been more notable than others. And their stories have survived long after the protagonists had melted away. 1. The first snowman ever drawn was Jewish. Uncovered by Bob Eckstein for his book, The History of the Snowman, the earliest known depiction of a snowman sits in a manuscript of The Book of Hours from 1380.The oddly anti-Semitic drawing features a Jewish snowman melting near a fire. The accompanying passage describes the crucifixion of Jesus. 2. 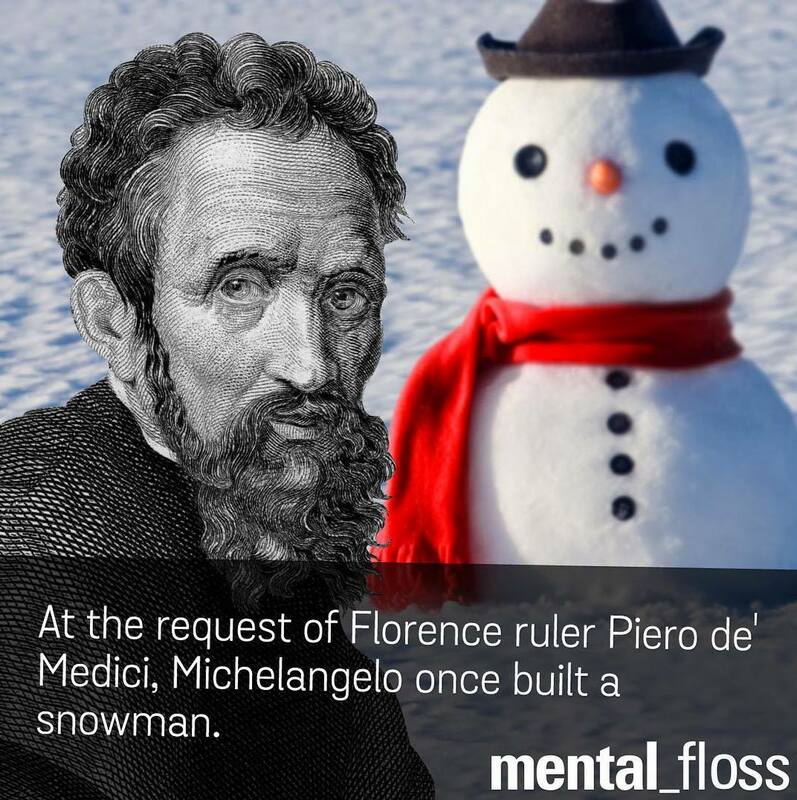 Your best snowman will probably never live up to the one Michelangelo made. In 1494, a prince known as Piero the Unfortunate commissioned the artist to build a snowman in the Medici courtyard. Though very little is written about the work, one art critic from the time said it was astonishingly beautiful. 3. Snowpeople have been used as acts of political protest. Though today’s snowman has become a reliable holiday character for those wishing to remain secular and apolitical, they weren’t always used for such impartial purposes. In 1511, people in Brussels were miserable. On top of being poor and hungry, they were also dealing with “The Winter of Death,” where freezing temperatures lingered over the city for months. The government decided that a snowman festival would be perfect for raising spirits. And they were right, just probably not in the way they had hoped. Aspiring snow artists covered the city in pornographic snow sculptures, as well as graphic caricatures of prominent citizens. The officials let them have their fun, hoping that as the sculptures vanished in the spring, the people’s angst would melt away too. 4. The snowman was one of the world’s earliest models. 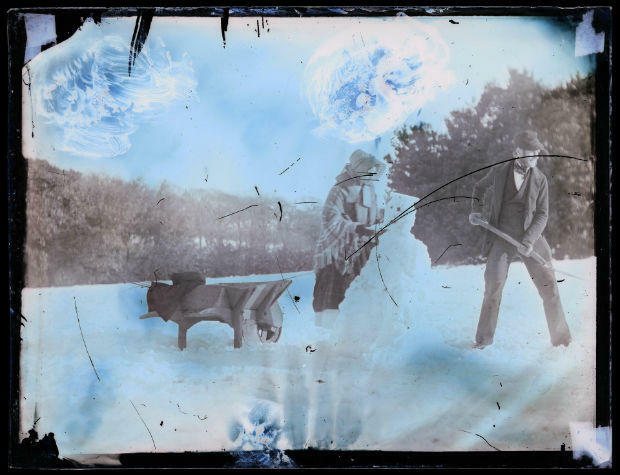 The first photograph of a snowman was taken by Mary Dillwyn in 1845, shortly after the camera was first invented. So, the first photo of a snowman is also one of the first photos of anything. Ever. 5. Snowmen may have helped the French fight Prussia. As the king of Prussia sought to expand his territory by invading Paris in 1870, two French soldiers and artists revived spirits with acts of snow sculpting. In the Bicêtre fortress, they constructed “The Resistance,” a snowwoman sitting on a cannon, and “The Republic,” a stoic snow-bust in a cap. The snow-crafts weren’t enough, though, and Prussia ultimately won the war of 1870. Some historians state that the grudge held by the people of France from this defeat helped drive the country’s victory in World War I. 6. The tallest snowperson in history is from Michigan. The home of the world’s tallest snowman is Bethel, Michigan. Bethel first earned the distinction in 1999 with Angus King of the Mountain. But when no other city rose to take the title in the ensuing years, Bethel decided they’d have to beat their own record. In a feat of feminism, they constructed Olympia – the 122-foot-tall snowwoman – in 2008. She had eyelashes made of skis, lips made of car tires, a 100-foot-long scarf, and a six-foot-long snowflake pendant. Credits: Smithsonian Magazine, Mental Floss Magazine, The History of the Snowman – Bob Eckstein, The Book of Hours, Annie Garou, Mary Dillwyn, Harbin International Ice and Snow Sculpture Festival. i learn so much each and every day and am always amazed. There’s a whole lot of fun in this post Beth. I’m humored by the use of snow peoples for centuries. And that humor was prevalent even in the ‘olden times’. This is interesting. An answer to a question I never thought of asking. Isn’t that funny how that happens sometimes? You made me wonder whether anyone had ever written a history of snowmen. Then I noticed your credit to Bob Eckstein’s The History of the Snowman. Now I can’t help wondering who wrote the first book or even essay about snowmen. Wow. That’s so cool. Snowmen, who knew? Wow the things you learn when you go look. Thanks Teach I appreciate that. Wow, I had never thought how fascinated people have been about snowmen! Interesting facts, Beth! I’ve never heard of him, so looked him up. Maybe not meant to be a leader, but there was so much intrigue back then, it was hard to hang onto power. Who knew there was so much to learn about snow people?? I love the idea of protesting with snow art. Get it out and let it melt and wash away your anger. There’s something kind of poetic about that. Neat. It’s too bad Michelangelo didn’t paint a portrait of his snowman. Yeah, I’ll bet this was way beneath him. He was a trooper. He wasn’t keen on the Cistene Chapel either, but thank goodness he did it anyway! i like them too, and who knew?